Bead Swap USA usually does a swap once a year or so where the beads or charms have to be handmade by the participants. It is my very favorite swap! It took me awhile to get brave enough to participate because I'm not a bead maker by any stretch of the imagination, but I am so glad I got up the courage! It's not only encouraged me to try a some different techniques to make my own charms, but it's also netted me some awesome handmade charms from others!! This year there were 27 of us and we (bravely) decided we would keep it all as one group rather than splitting it up. That meant each of us had to make 27 charms, which isn't too bad for some techniques, but for others like bead weaving... Boy, those ladies are incredibly brave to even try to take on a project like this one. My hat's off to them! A few of those pieces were "extras" added as hostess gifts and a couple others were from another swap in that group, but mostly they are charms from this swap. Pretty cool, huh? The charms I made this year were epoxy clay and that was a first for me. It was lots of fun and I did a post about it here. 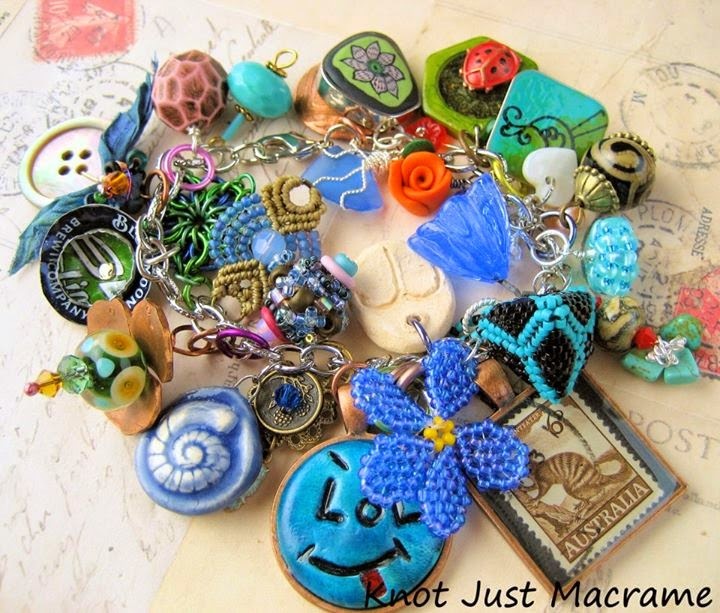 I made a charm bracelet using some of the charms from previous swaps and a few other treasured pieces. It's really jangly and noisy and fun to wear and each one of the charms on it has special meaning to me. It doesn't get much better than that! If you'd like to see who gave me the charms on the bracelet, I've tagged them here. Think I can find room on there for my new treasures? Beautiful charms! I recognize some of them from swaps I have done in the past.